Become a Product Tester! I love Testing Full Size Products! So much better than samples!! 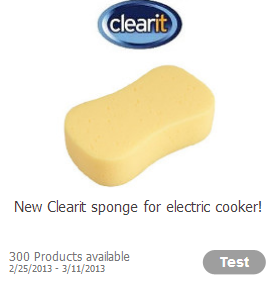 They are giving away 300 Clearit Sponges for your Electric Cooker! to be a candidate for products to test!!!! one gives you the date when it will be available. these items are up for grabs!! Want to increase your chances to be selected? for more than just free stuff!!! Click the HERE to sign up. If you do all that is listed above you should be earning money and testing products in no time flat! I hope you enjoy yourself as much as I do!